The above photograph shows the only part of my wardrobe that I can open the door on without everything falling out. I swear it’s like I’m one of those people with the hoarding problems – I just found a bottle of body lotion that I know I bought in 1997, and a bra that I got in the Harrods sale in 2001 for £4! It’s the wrong size! I’ve become quite a lot better, in recent years, about being careful with the things that I buy (let’s ignore the recent Jimmy Choo glitter pumps escapade and also the tiny thing that I may have bought in the Burberry outlet store, and also the Herve Leger dress I’ve worm a grand total of once) but when you find it difficult to throw things out, you’re bound to run out of wardrobe space. I often take a bag of bits and pieces to the charity shop or give away to friends (and daughters-of-friends, which makes me feel very old!) and I am sometimes partial to a bit of an eBay purge, but there are some items that are a little too precious for that. A Vivienne Westwood corset, for example, that I was given instead of actual money when I worked for her many years ago. Dresses from Ghost, (same situation), an extraordinary Jenny Packham dress (again, payment for a job – seeing a trend yet?) and a whole load of dresses, tops and unworn lingerie. What to do with these treasures? I’ll tell you: I’m selling them all at this amazing live event run by Buy My Wardrobe! They usually exist online (the website is linked in below) but every so often they do a live event, and that’s what I’m showing up at. 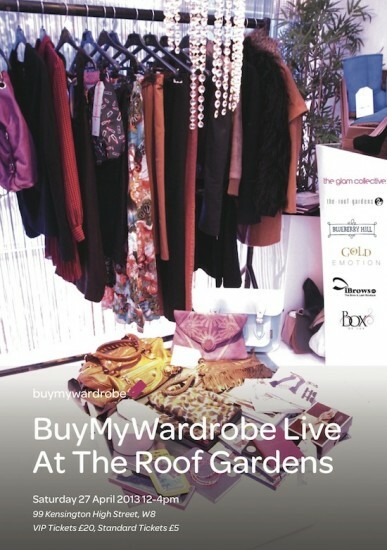 Yes, like a travelling rag ‘n bone woman, I’m bringing my wares to the Kensington Roof Gardens on Saturday 27th April and hoping to have a fun day chatting and (I’m guessing) eyeing up everyone else’s wardrobes! I wonder if we can do swaps on things? I must remember to ask! 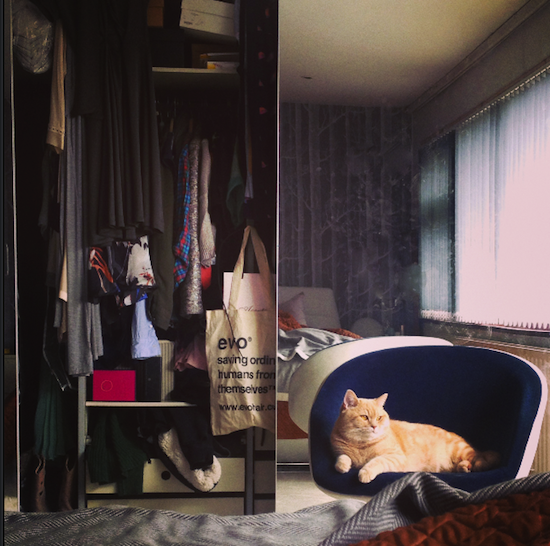 Anyway, there’ll be lots of amazing wardrobe items for sale, not just from me, so it sounds like a great day. Tickets start at £5 for standard entry (at 1pm) but there’s also a VIP option for £20 which includes early entry (12pm) and champagne and a goody bag. I have two VIP tickets to give away to one lucky reader – I’ve done it this way rather than giving a ticket each to two readers because I thought that it would be the perfect girly day out for two friends. There are loads of lovely things to do around Kensington, so you could make it a proper little expedition – brunch, perhaps, then raiding people’s wardrobes, and then – I don’t know – off to a bar? That’s what I’d be up to at any rate! To enter, please leave a comment below to register your interest. PLEASE make sure you can get yourself to London on the 27th April – I’d hate the tickets to be wasted! All comments must be left before 12pm BST on Wednesday 17th April 2013 and winners must respond within 48 hours, please, so that I can get the tickets out! Previous Post Bikini Shoot Behind-the-Scenes!